Archos and I have some issues to debate over our definition of the words "power" and "cobalt." The company keeps on churning new devices every couple of months, seemingly content with the sales and reception it's getting by sticking to the low to mid range of the smartphone market. It just unveiled two new lines of devices for CES, named Power and Cobalt, with two new models on each line. However, it's not my understanding that 1900mAh (or 512MB of RAM) equates to power, or that dark grey is synonymous with cobalt. But let's not get ahead of ourselves. The new Power line has its eyes set on battery life (not performance) and it will be launched with the Archos 40 Power and 50 Power. The first is a small 4" screen phone with a 1900mAh battery and 512MB of RAM, the second is a 5" phone with a 4000mAh battery and more appropriate specs. Thanks to its reduced screen size and processor, Archos promises two days of battery life on the 40 Power, which in my opinion would have been even more impressive with a slightly larger battery or some better specs. The Archos Cobalt line stems from the company's previous ventures into vivid devices such as the yellow Archos 50 Diamond and the pink and blue Archos 50c Platinum, and aims to bring color to both the front and the back of each phone. Its first two models are the Archos 50 Cobalt and the 50 Cobalt Plus (pictured at the top of the article), both available in cobalt blue and dark grey. Yeah, the latter is more greyscale than cobalt, but I suppose it still counts as a monochrome version of cobalt... maybe? All 4 devices have a dual-SIM slot and run Android 5.1. The Power line will be available in May, whereas the Cobalt line will come in April. Personally, I think the Archos 50 Power is the most interesting device in this line-up thanks to its decent specs and great battery. At €129.99, it's also very affordable. 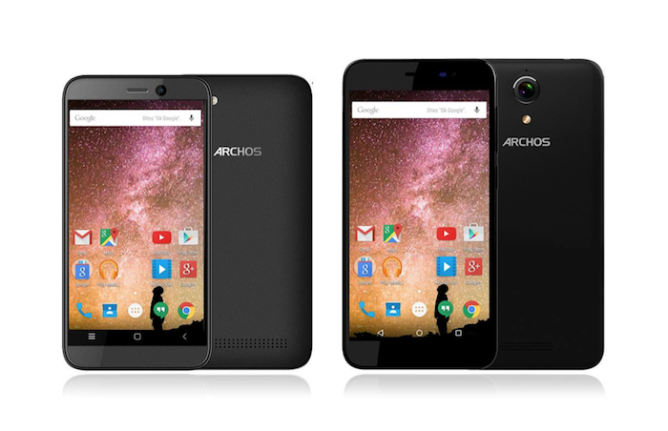 Extended battery and colors in the two latest ARCHOS smartphones ranges. London, January 4th, 2016 – French electronics brand, ARCHOS, launches two new ranges of smartphones, the Power line and the Cobalt line at CES 2016 in Las Vegas, Nevada. “In order to offer an ever more complete range, ARCHOS is launching two new lines of smartphones to address consumer demands for longer lasting battery life and colors in affordable products” says Loic Poirier, CEO of ARCHOS. The ARCHOS 40 Power is a 4’’ 3G smartphone equipped with a quad-core processor and 8 GB of internal storage. It differentiates itself by its high battery capacity, 1900mAh, in a 4’’ format that fits in your pocket. It provides its user with up to two days of battery life – almost double the standard battery life. 4G/LTE compatible, the ARCHOS 50 Power is a 5’’ smartphone propelled by a quad- core processor, has 2 GB of RAM and 16GB of internal memory. In addition, its IPS HD display and its 13 MP back camera make the ARCHOS 50 Power a fully equipped smartphone intensive uses. The ARCHOS 40 Power will be available in May for 49,99€ The ARCHOS 50 Power will cost 129,99€. Colour casing forerunners, the yellow-backed ARCHOS 50 Diamond and the ARCHOS 50c Platinum with its pink and blue back casings have led the way for the all new Cobalt range, now fully coloured smartphones, in cobalt blue or dark grey, both front and back. Available in two screen sizes, the ARCHOS 50 Cobalt and the ARCHOS 55 Cobalt Plus smartphones are both equipped with an IPS HD display, a powerful 4G/LTE quad-core processor backed by 1 GB of RAM for the 5’’ version and 2 GB of RAM for the 5.5’’ version for a smoother user experience. The 8 MP camera of the 5” and the 13 MP camera of the 5.5” create high quality pictures with 8 GB and 16 GB versions providing ample storage options. For those that need even more internal storage a MicroSD card can be added. 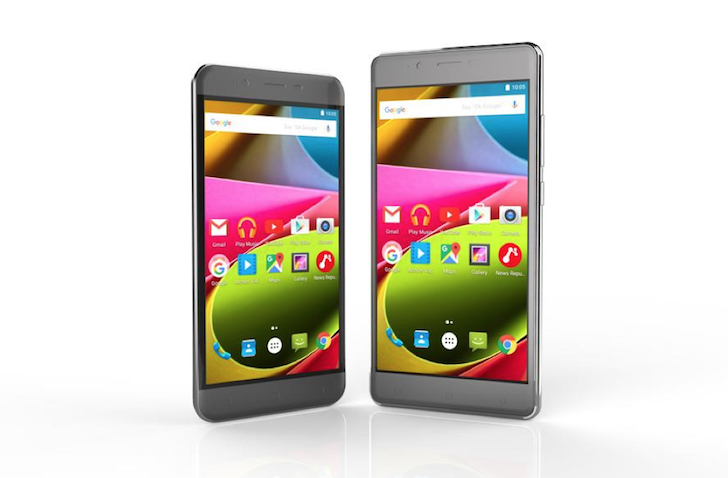 Available in April, the ARCHOS 50 Cobalt will cost 99€ while the ARCHOS 55 Cobalt will be priced at 149€. ARCHOS will unveil both new Cobalt and Power ranges for the first time at CES in Las Vegas from January 5th to 8th 2016. Come discover the ARCHOS showroom at the Westgate Las Vegas Resort (Suite 1910).